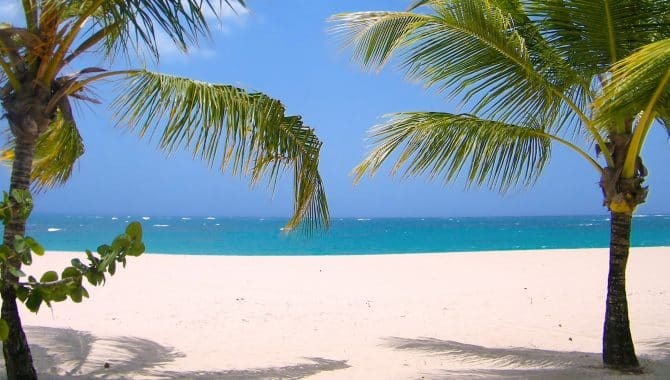 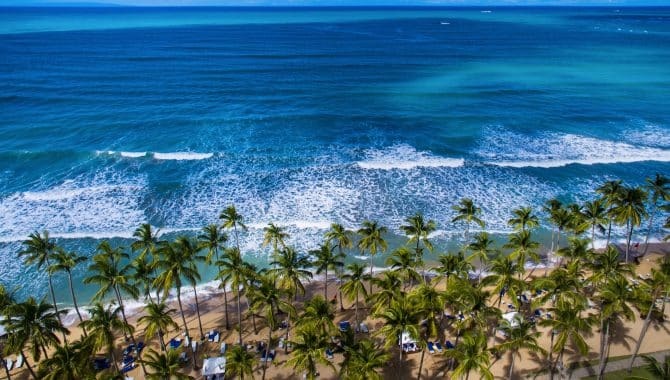 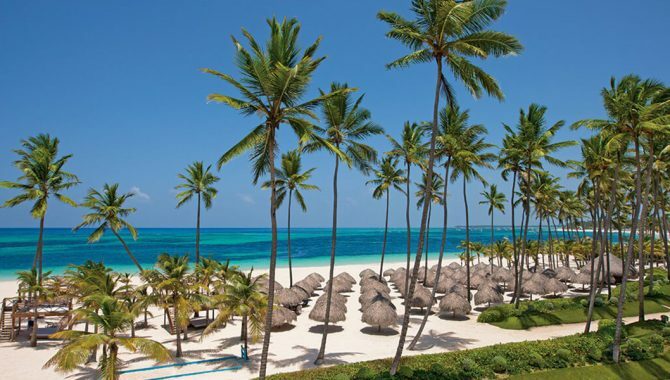 The Dominican Republic is teeming with mood-setting natural beauty and stunning white sand beaches—the perfect backdrop for a relaxing beach vacation. 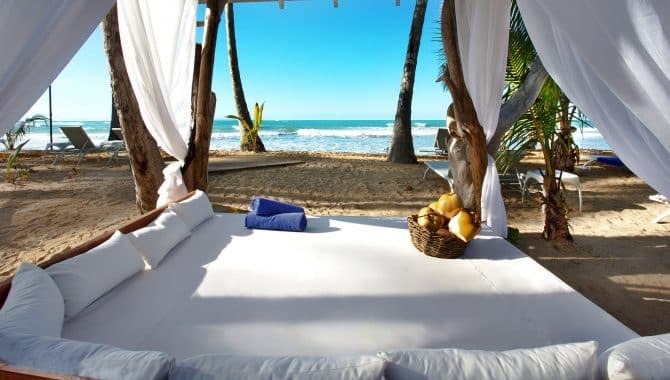 Who wouldn’t want to share an intimate moment or girls’ trip here, gazing out onto seemingly endless blue waters? 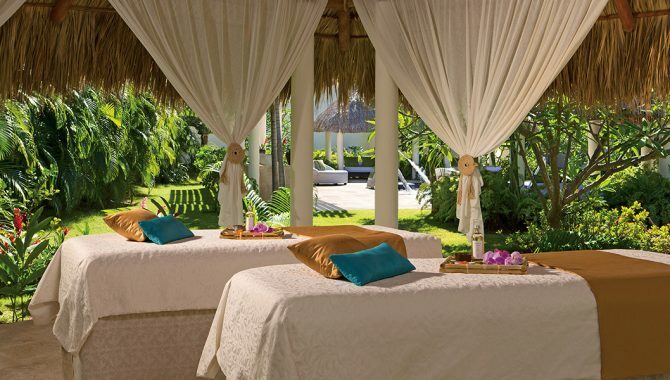 Find that moment of serenity by staying at an adults-only resort. 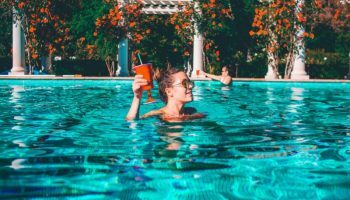 By implementing an age requirement on resort grounds, these resorts allow guests the luxury of a relaxing vacation free of children. 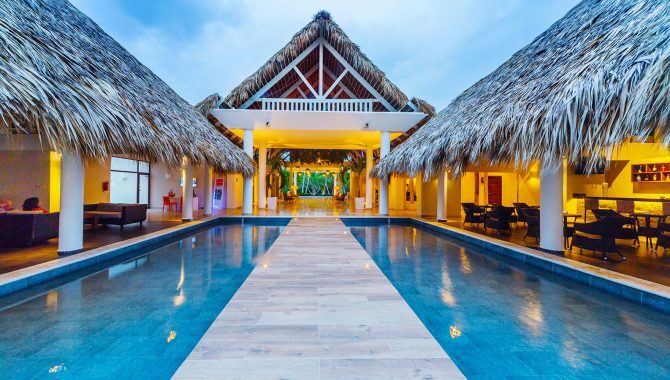 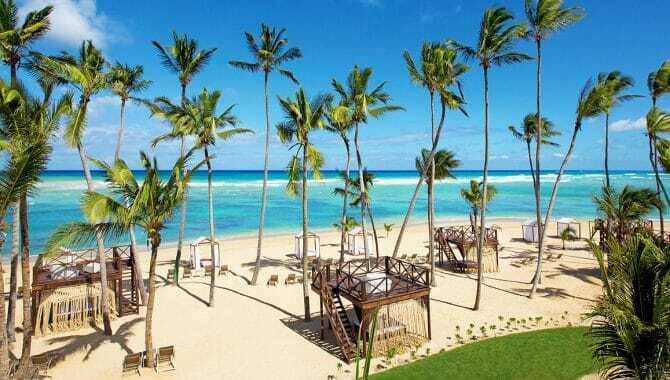 Here are the 10 best adults-only resorts in the Dominican Republic. 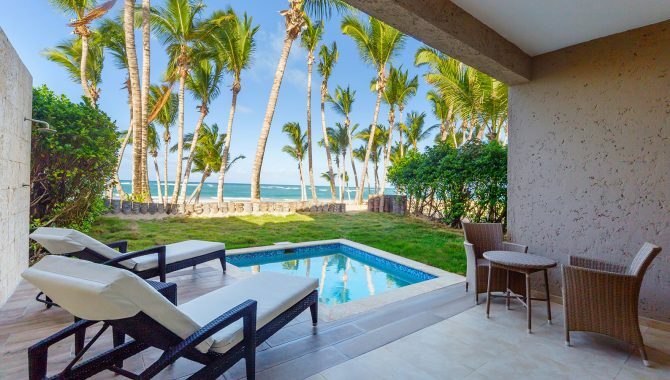 The setting is a dream—a quiet enclave on Arena Gorda providing postcard-perfect views of palm trees and a cerulean coast. 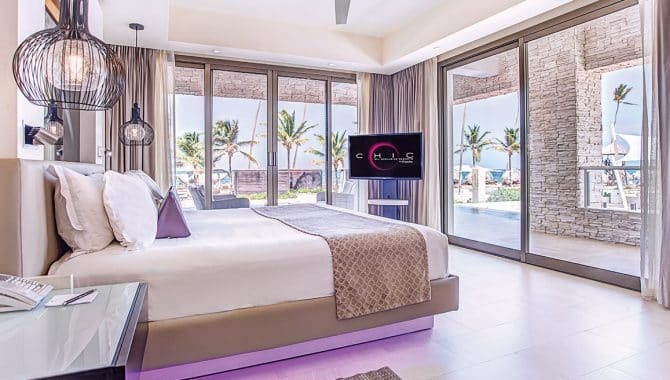 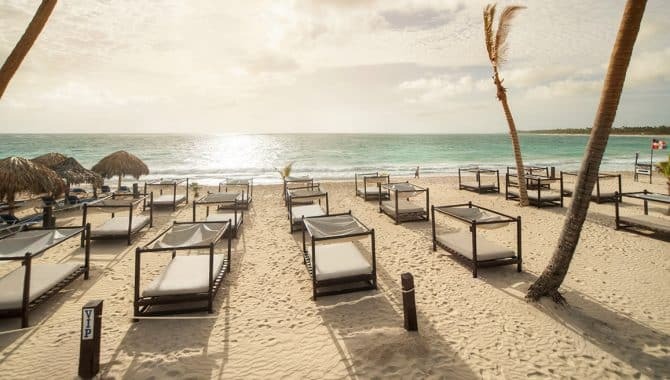 Hotel Riu Palace Macao’s all-inclusive program includes Dominican and international cuisine, unlimited premium-branded drinks, access to world-class amenities like the fresh-water swimming pool and the opportunity to try gymnastics, windsurfing, sailing and more. 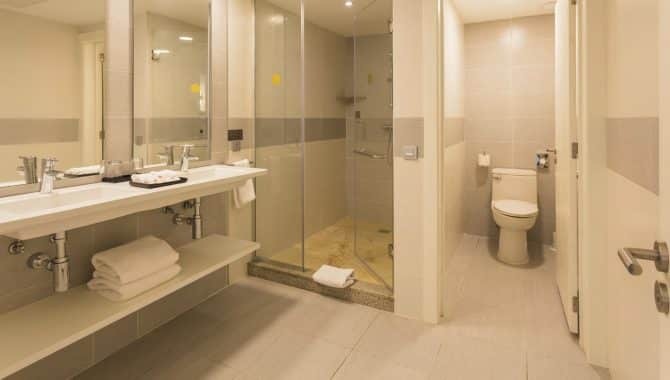 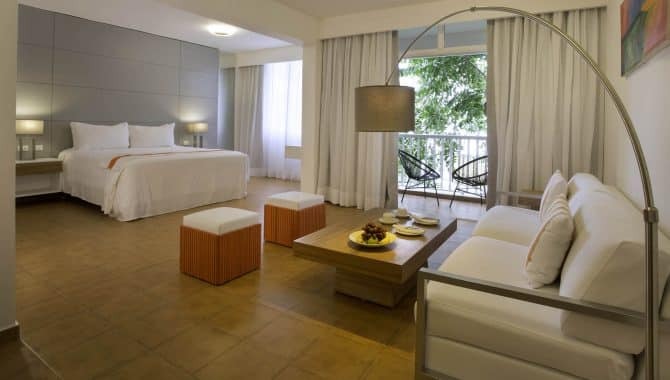 All the rooms are tastefully styled with modern decor, plush bedding, minibars and flat-screen TVs, but if you really want to rejuvenate, book the Jacuzzi Suite. 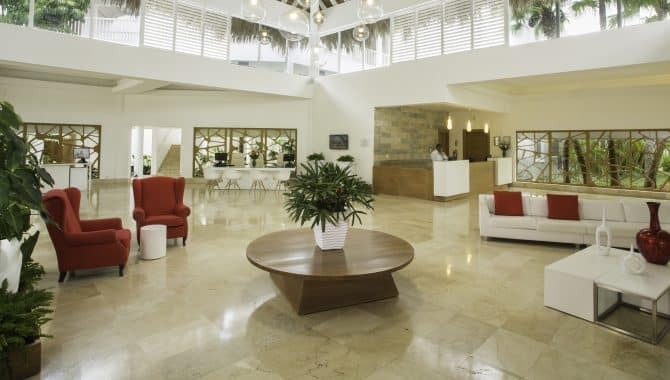 The fitness center and Renova Spa are just a walk away at RIU Palace Bavaro should you need to expend some energy or indulge in a massage or beauty treatment. 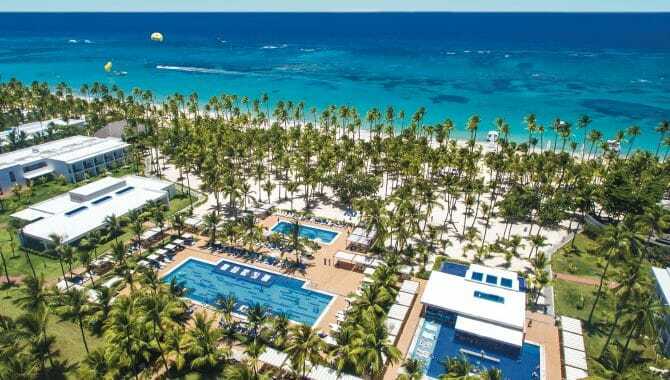 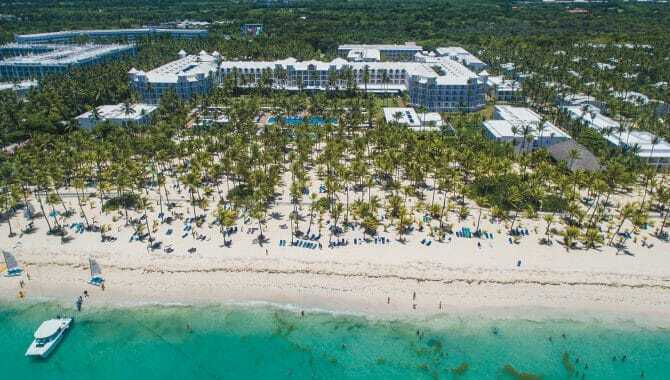 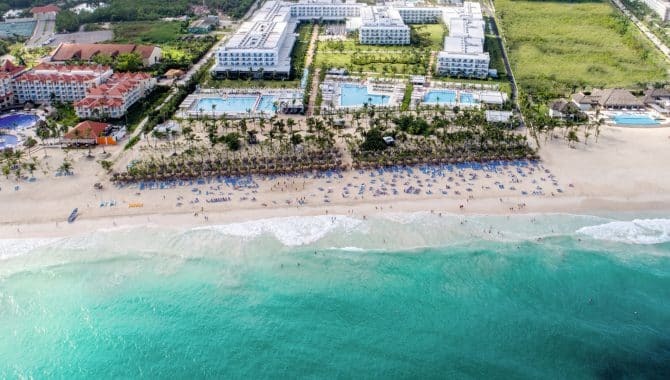 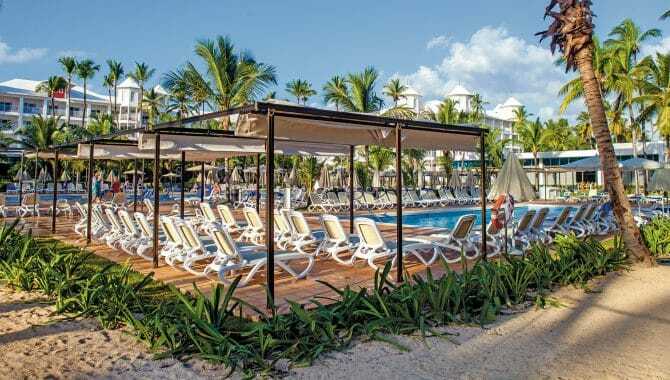 Kids aren’t allowed on the premises, but guests are encouraged to get in touch with their inner-child—RIU Hotels and Resorts guests get free admission to Splash Water World in Punta Cana. 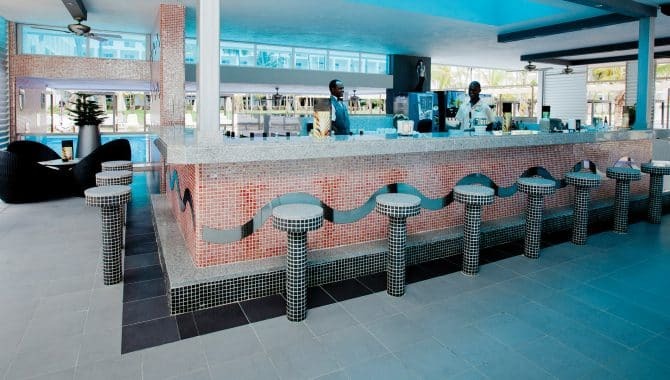 At Hotel Riu Republica the clientele love partying and a drink is never far away. 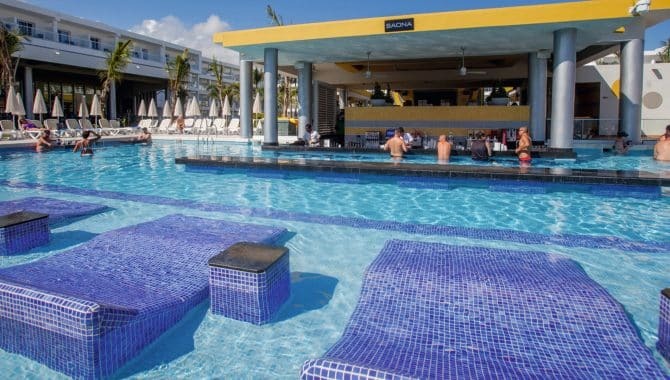 This adults-only playground has more than 1,300 rooms, eight swimming pools, 10 bars and nine restaurants. 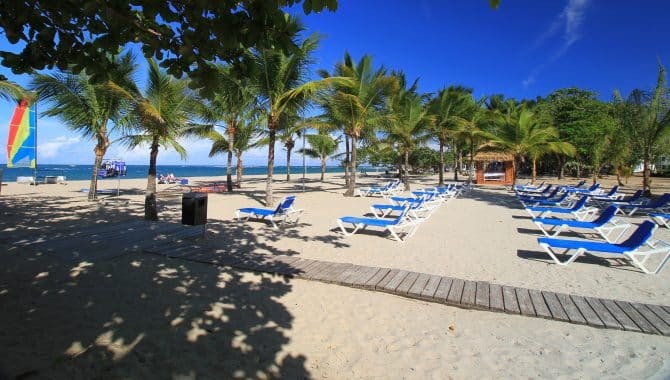 Spending the entire day at the beach is easy here, it’s stunning and unoccupied loungers are never hard to find. 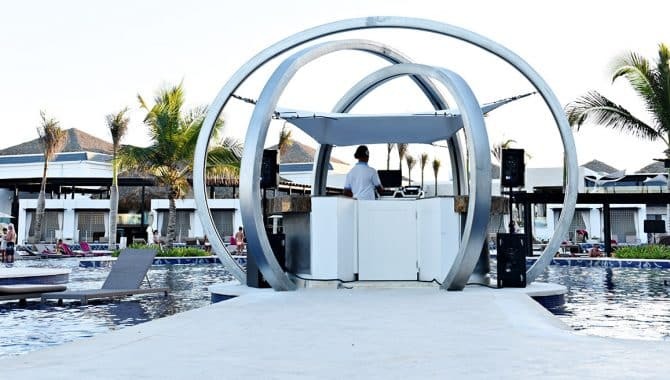 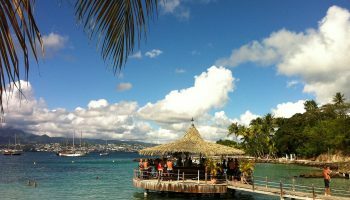 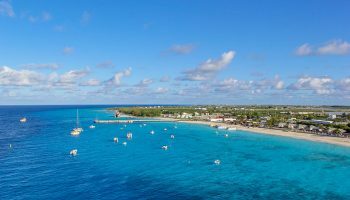 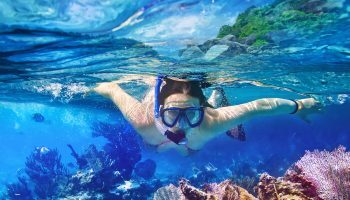 Around-the-clock entertainment means waterslides, kayaking, scuba lessons and beach volleyball are just the beginning of the fun; there are also beach barbeques, Michael Jackson shows and a nightclub. 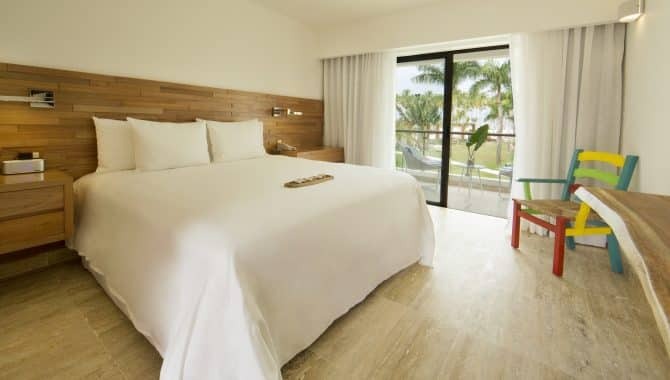 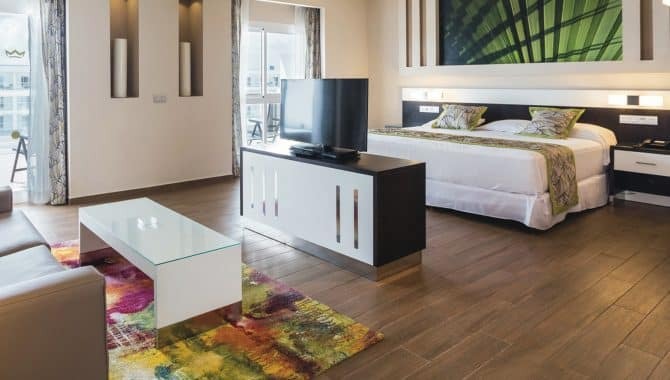 When you’re ready to crash in the evening (or the wee hours of the morning), beachy vibes and plush bedding welcome you to your room equipped with a terrace or balcony, satellite TV and a safe. 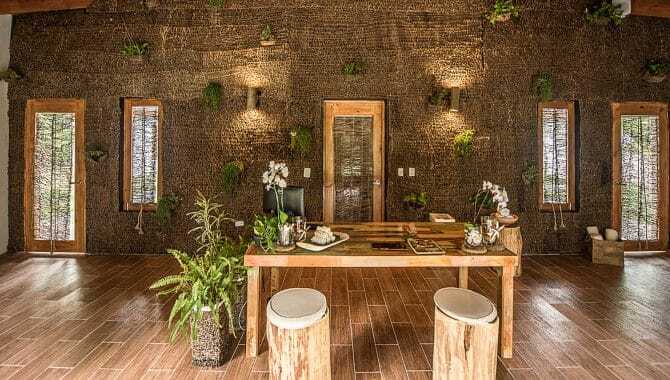 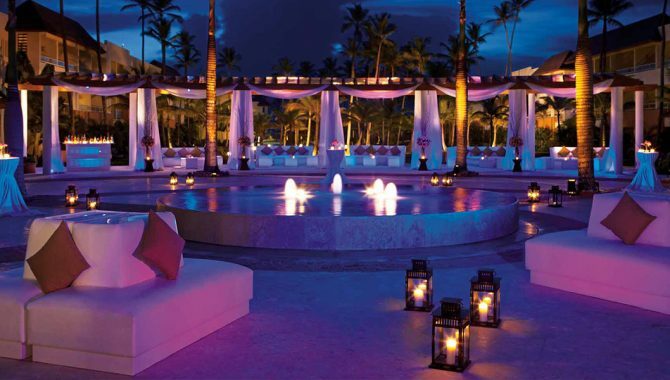 In addition to the Asian, Italian, Indian and steakhouse restaurants, couples looking to turn up the heat can arrange a romantic al fresco dinner or couples Aromatherapy & Deep Tissue Massage for an additional charge. 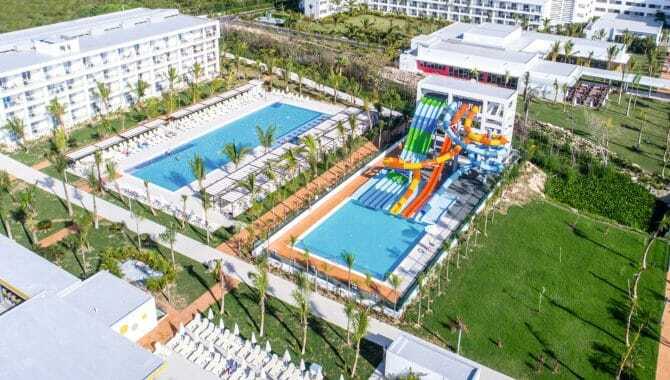 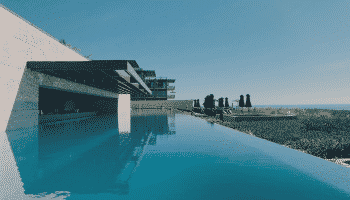 Tropical beauty meets modern facilities at Viva Wyndham V Heavens. 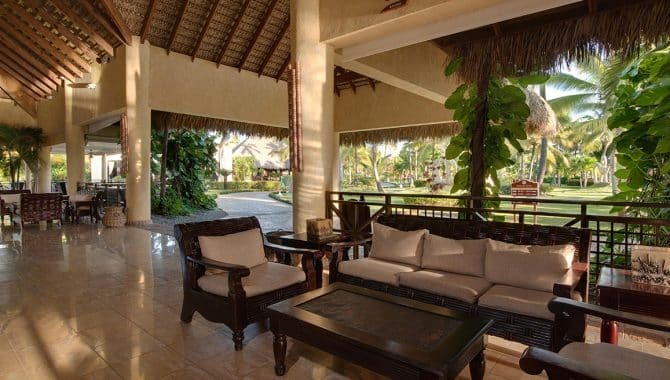 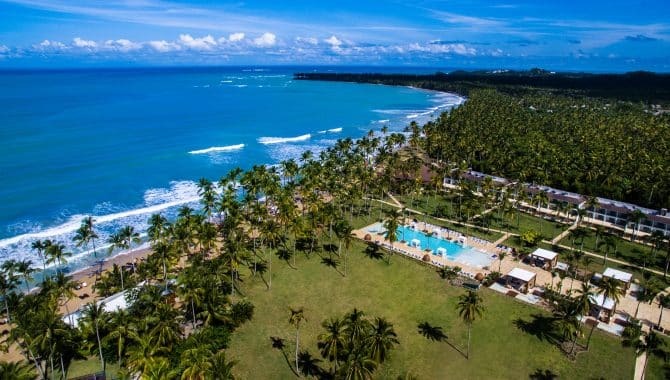 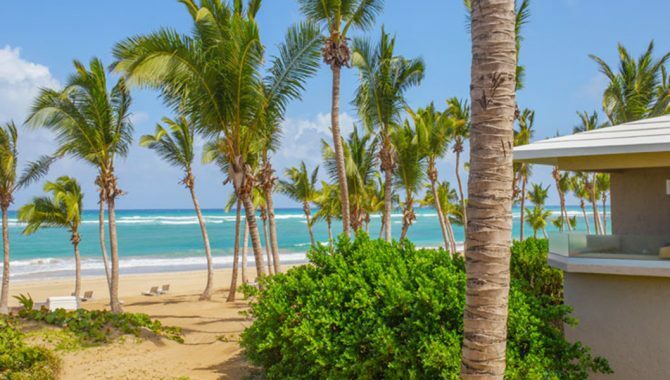 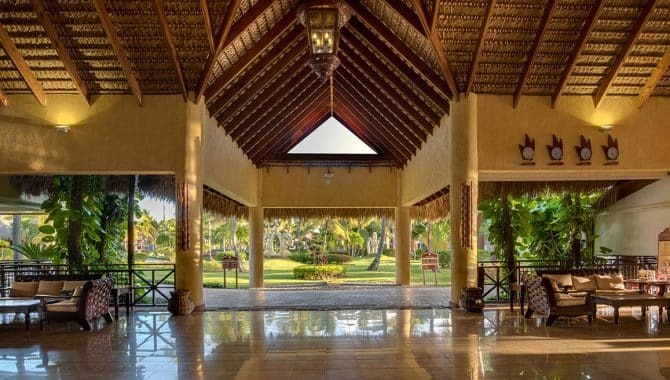 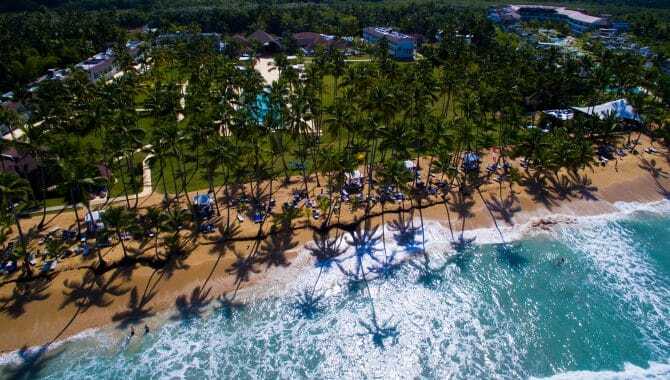 The gorgeous property is laden with palm trees and serene Playa Dorado Beach leaves you wanting for nothing in a beach vacation. 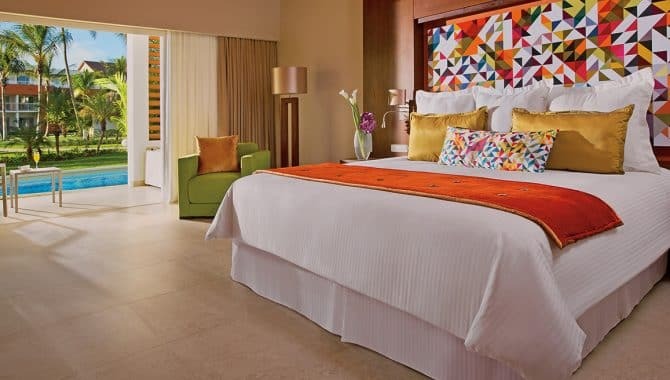 Each modern room has subtle tones, plush bedding equipped with WynRest® linens and its own balcony—the perfect spot for enjoying an in-room dinner. 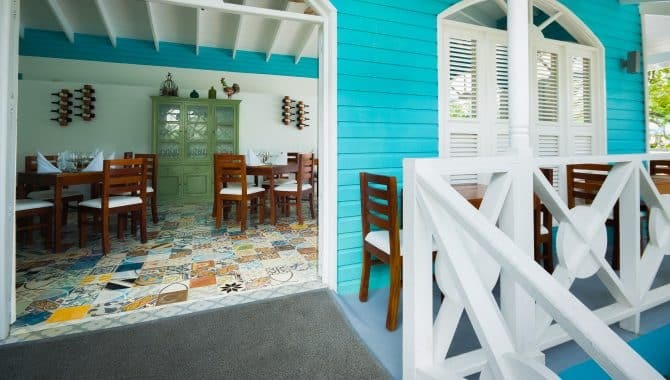 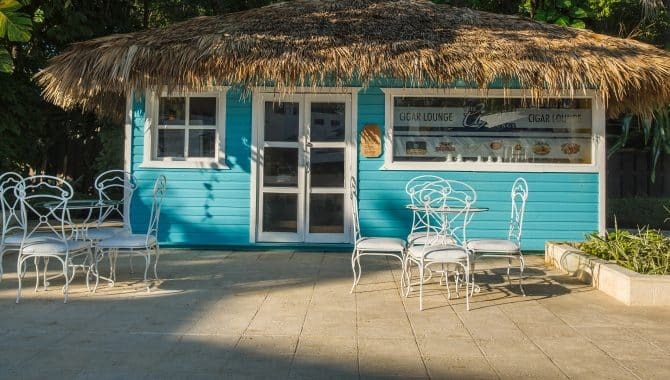 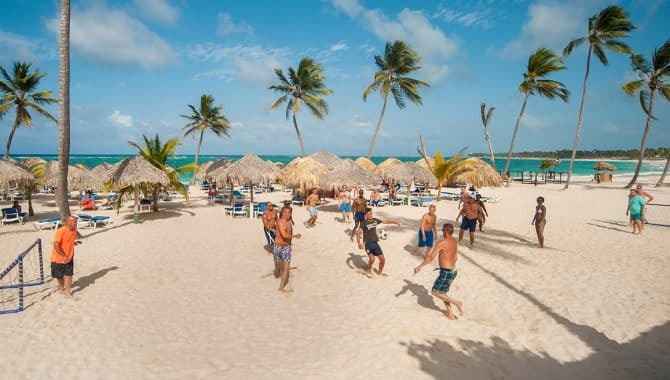 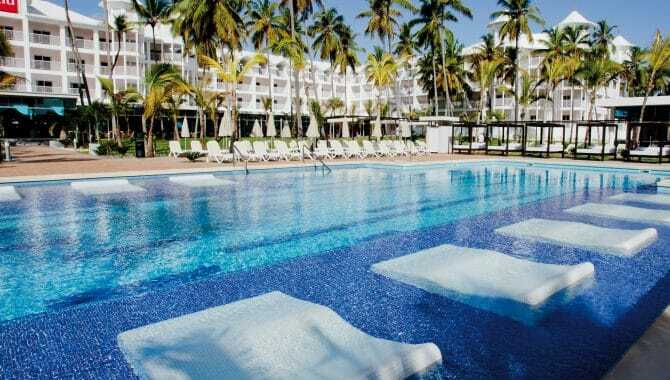 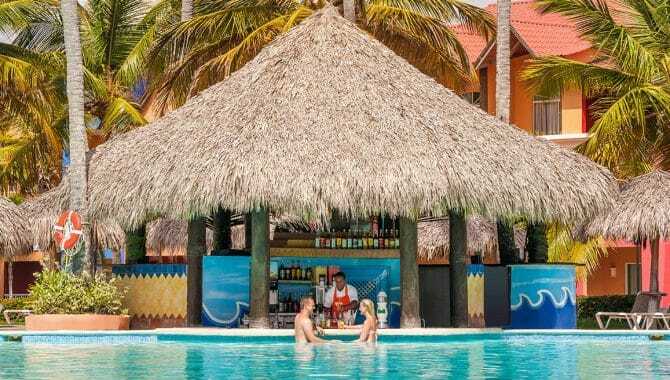 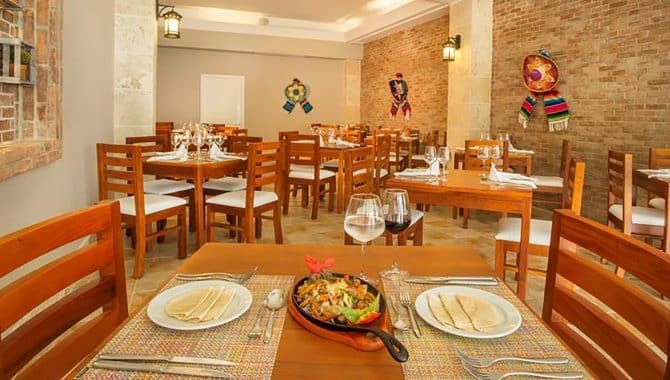 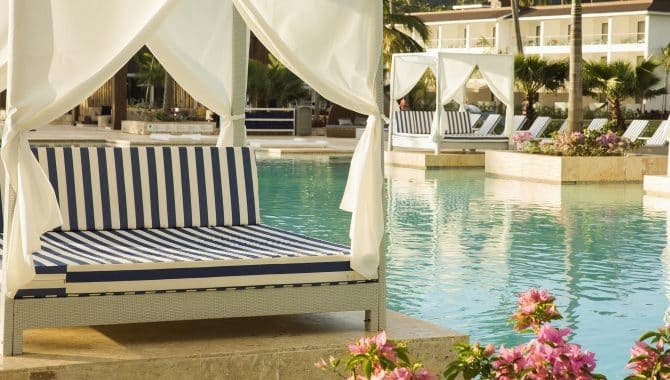 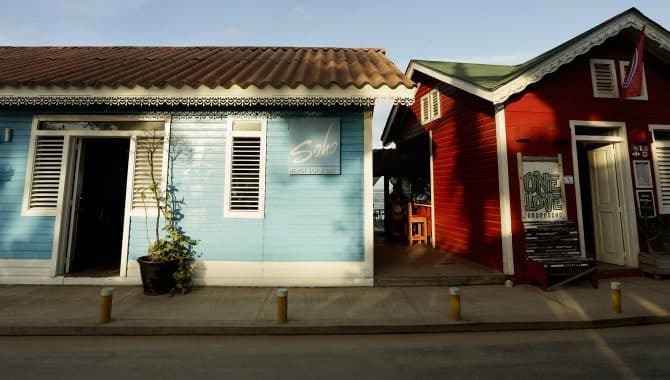 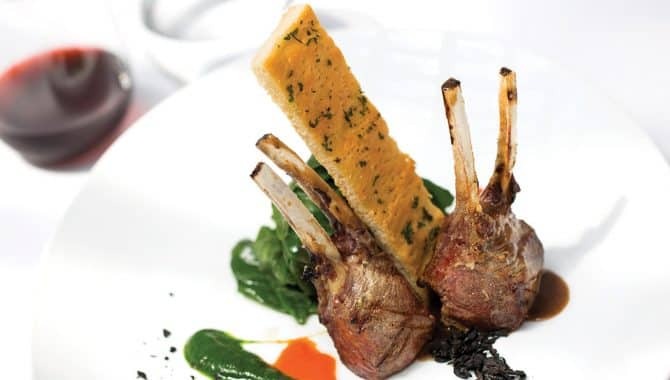 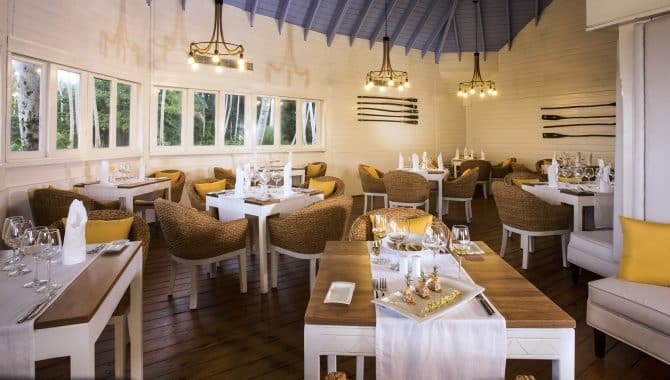 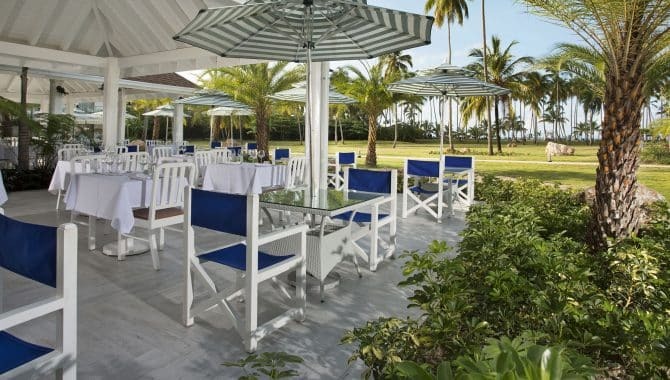 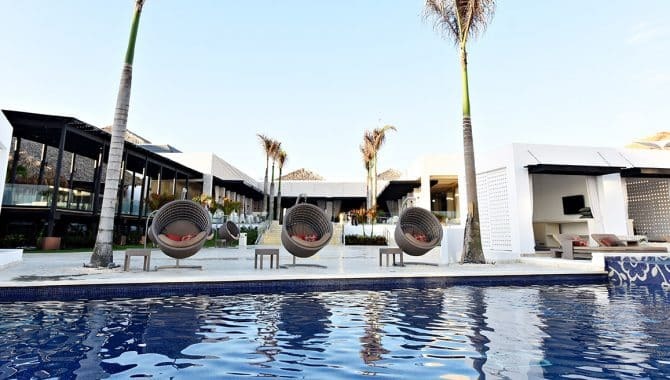 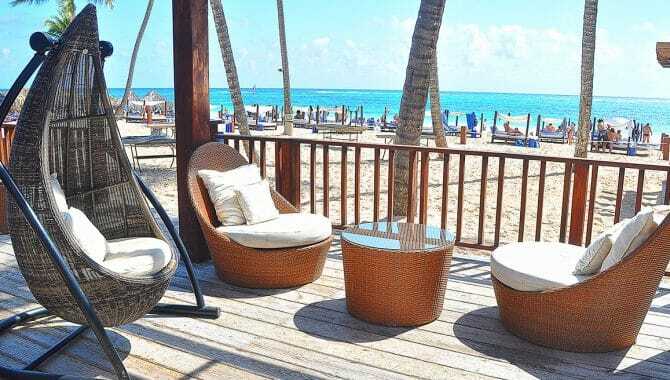 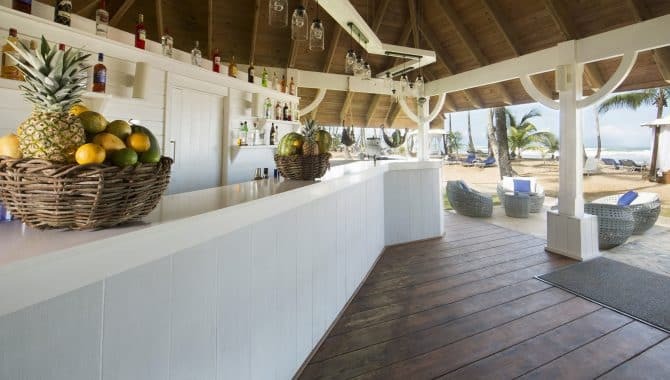 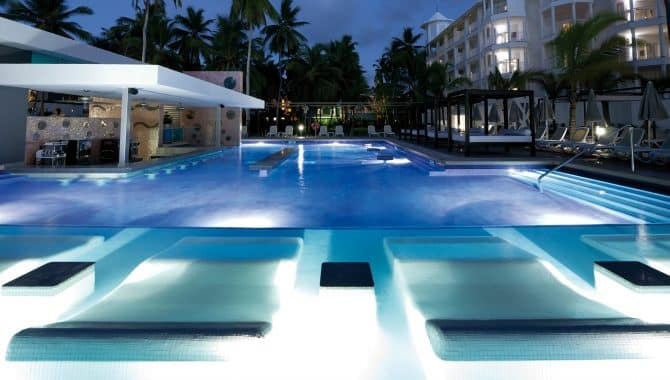 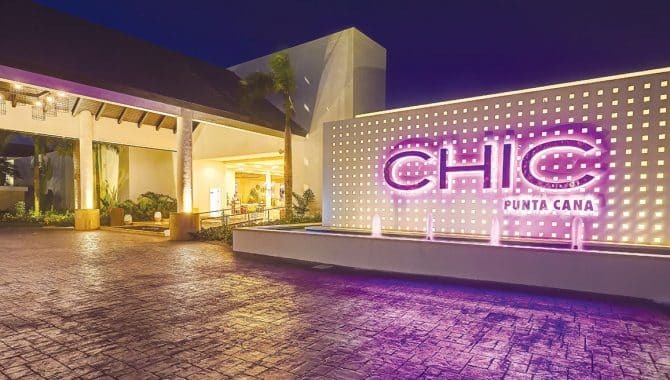 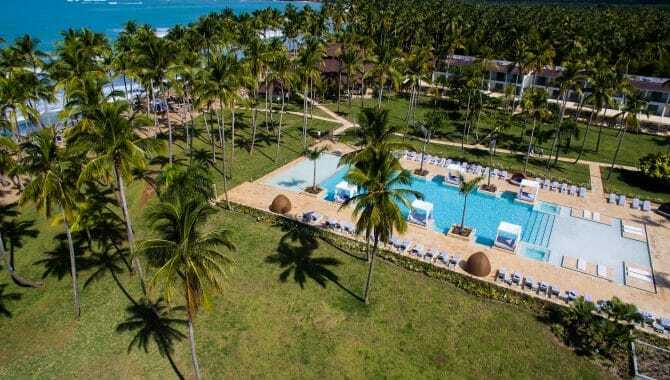 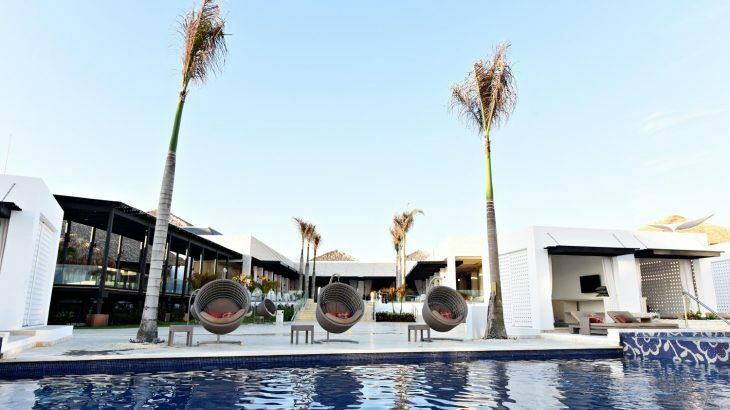 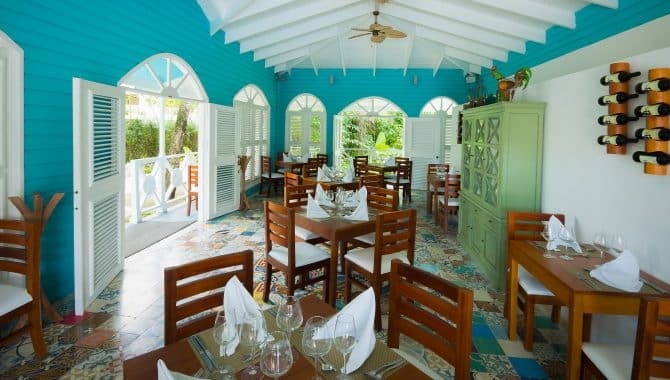 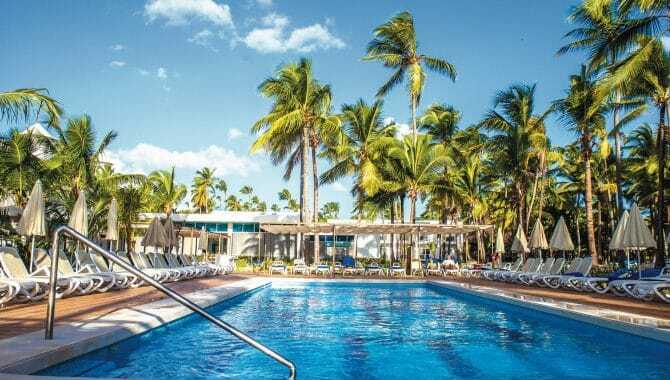 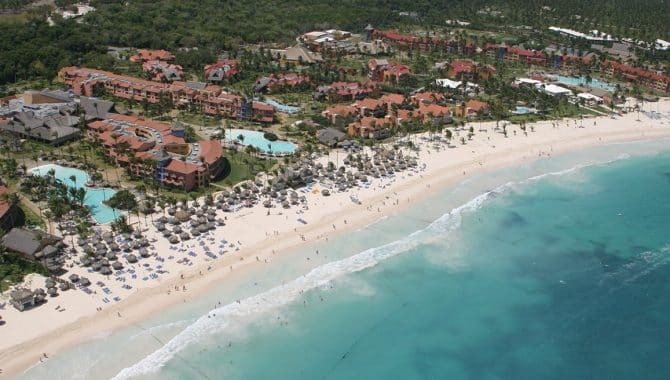 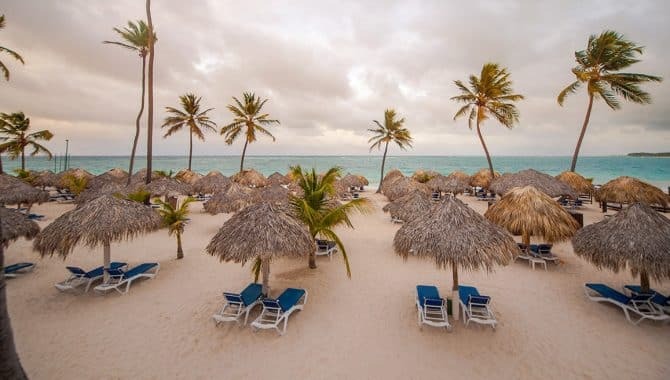 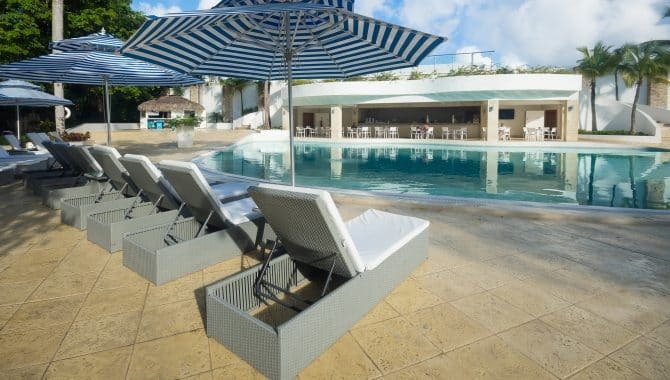 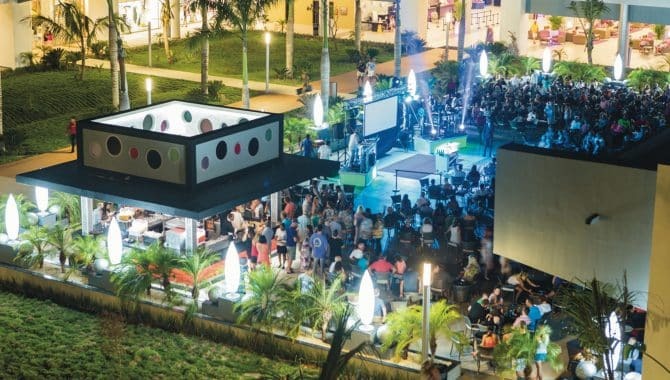 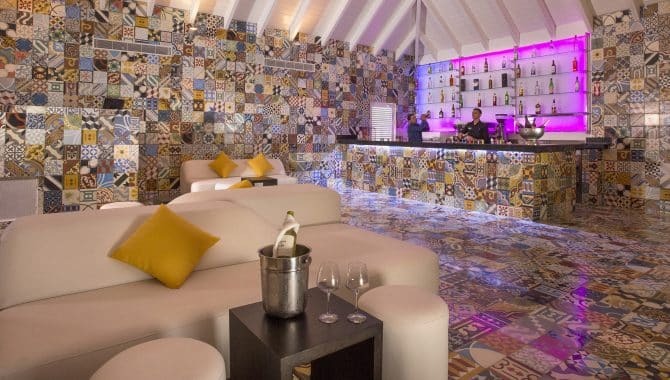 Or, choose from seven on-site restaurants and bars with a variety spanning authentic Dominican cuisine to mouthwatering Italian—plus, there’s a snack bar on the beach so you don’t have to go far from your lounger to recharge. 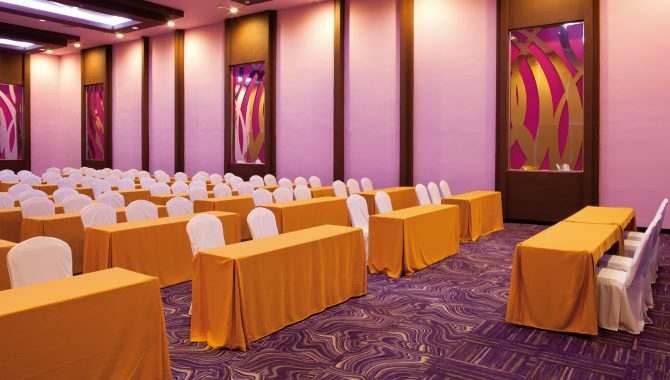 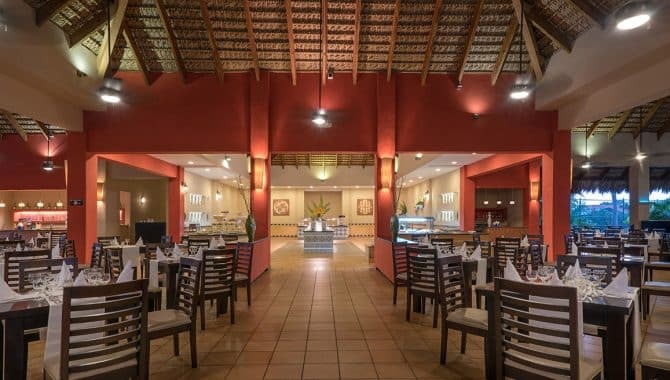 The theatre has a different show every night so you’ll never tire, but the theme nights and live music also provide an entertaining evening with little effort on your part. 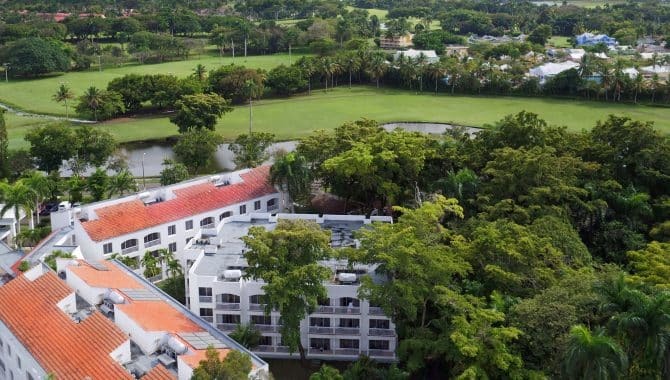 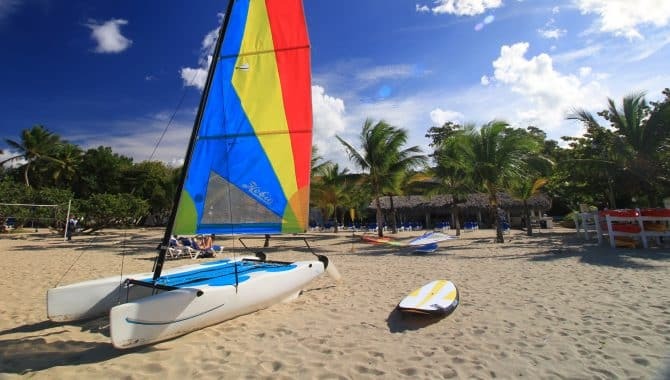 As far as activity, you have the world at your fingertips with a fitness center, kayaking, windsurfing, tennis and more. 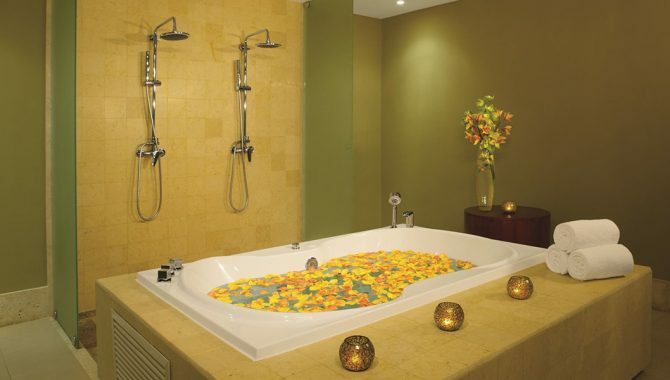 End your day with a soothing spa treatment or dip in the hot tub. 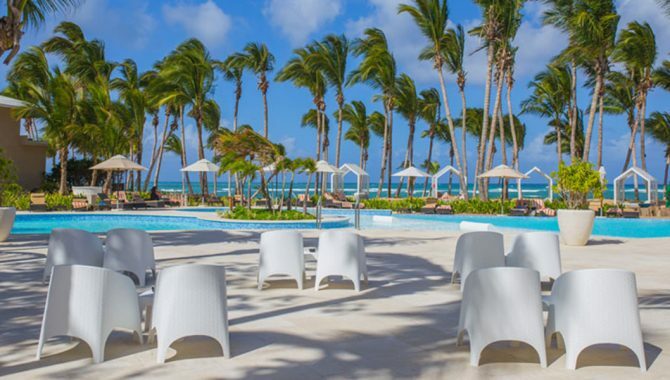 Viva Wyndham V Samana effortlessly puts everything you need for a stress-free vacation at your fingertips—and at no additional cost. 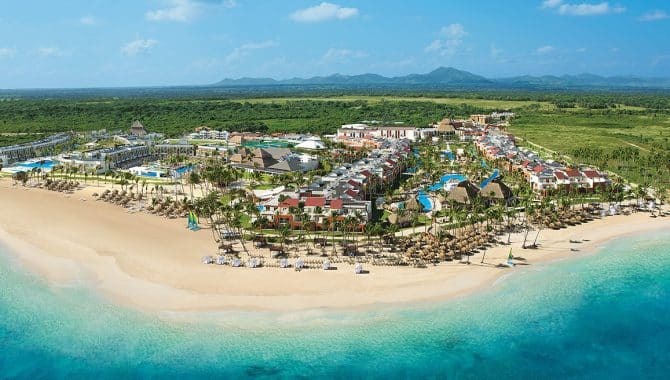 This all-inclusive, adults-only resort thought of everything, not to mention the stunning property practically melts worries on arrival. 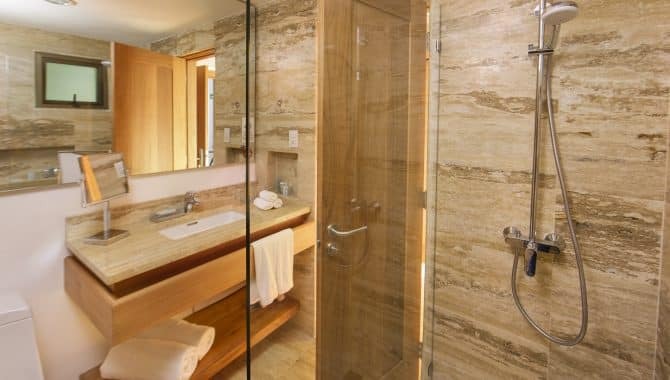 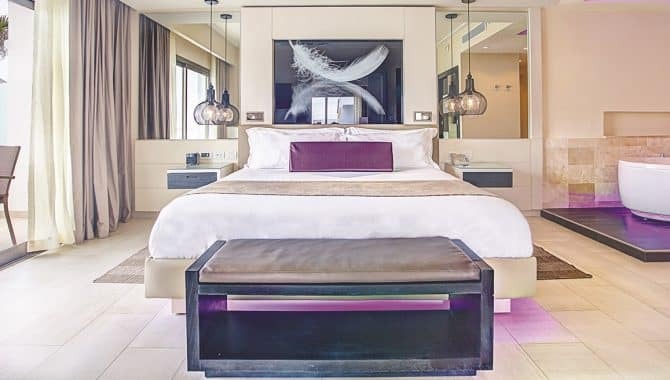 Renovated rooms with calming earth tones and wood grains make each a cozy escape in addition to WiFi, 24-hour room service and turndown service. 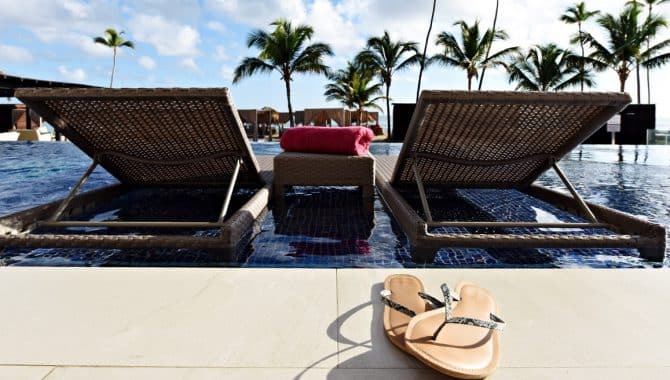 Wind down with a yoga class or easy bike ride throughout the property before a cooling dip in the breathtaking infinity pool. 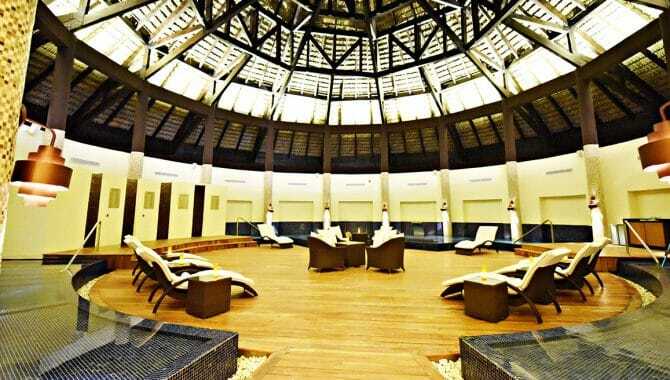 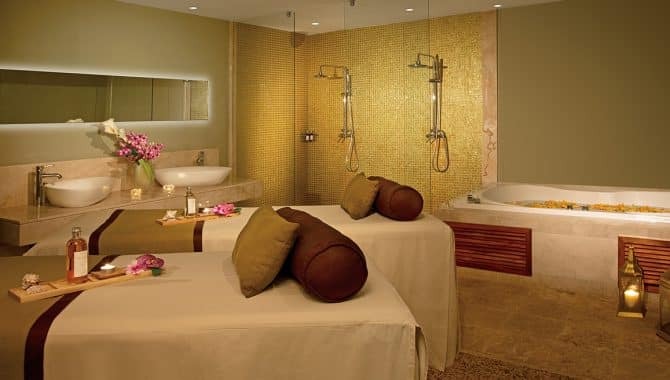 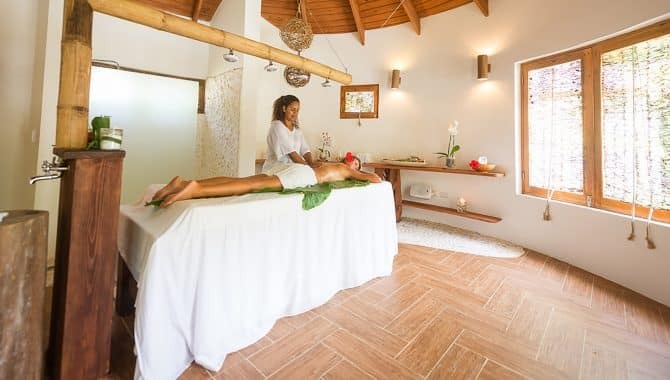 Allow experts to melt your worries away at Coconut Whispers Spa with a couples massage and fresh coconut drinks. 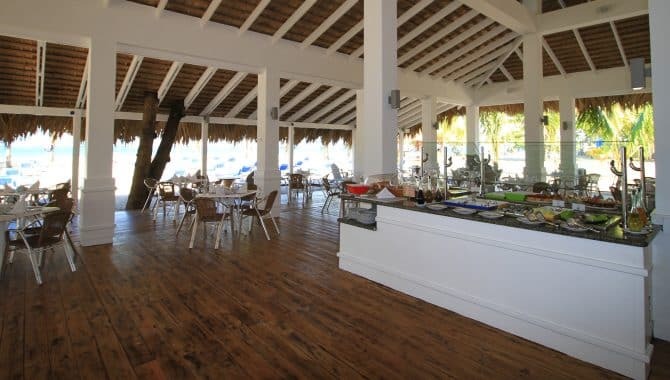 The on-site fusion, seafood and Mediterranean a la carte restaurants never require reservations and the modern cocktail lounge and juice bar serve up beverages for any time of day. 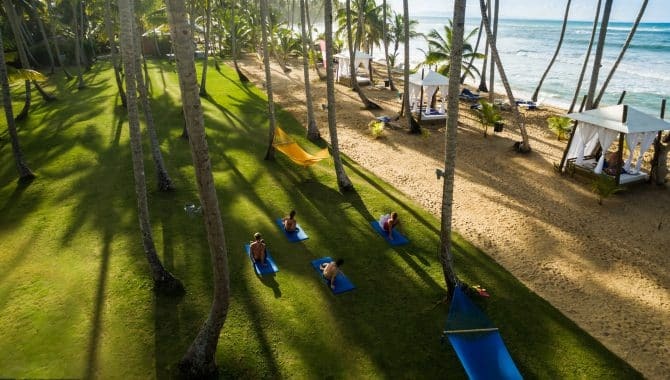 Choose your daily adventure with hiking the lush surroundings, kayaking or beach volleyball on the menu. 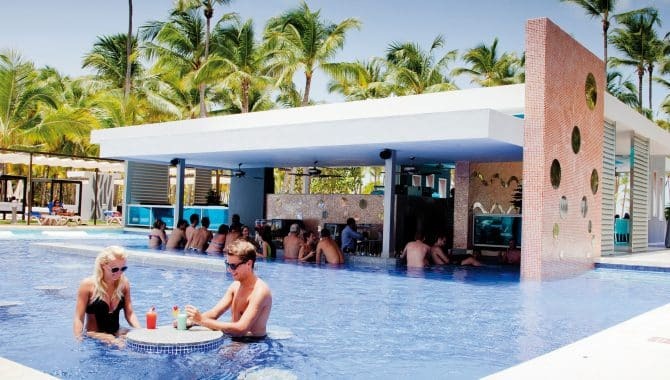 With Coson Beach right outside you’re door, you’ll soak up plenty of sun with your top-shelf cocktail of choice in hand. 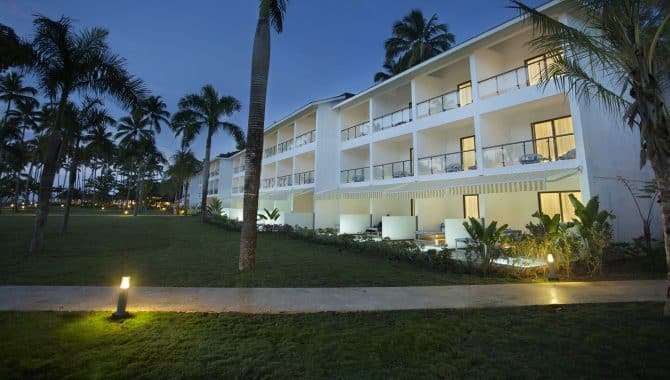 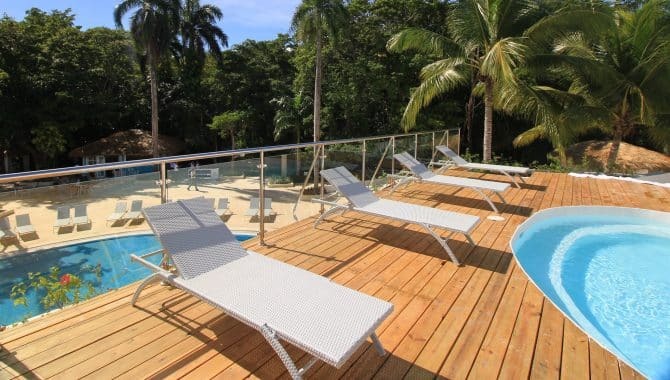 This is what it means to vacation at Viva Wyndham V Samana. 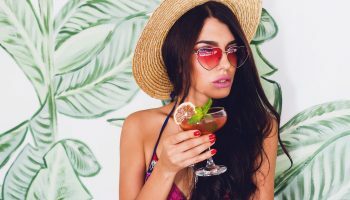 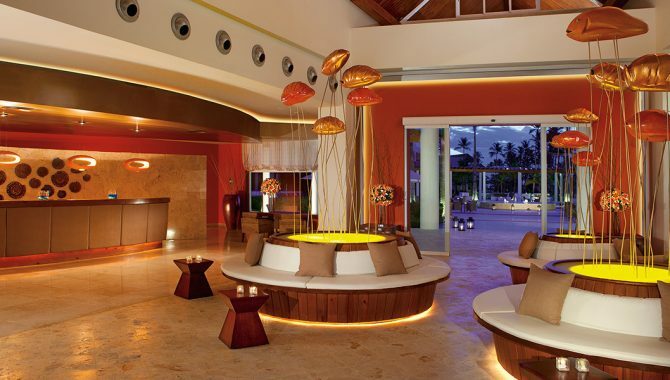 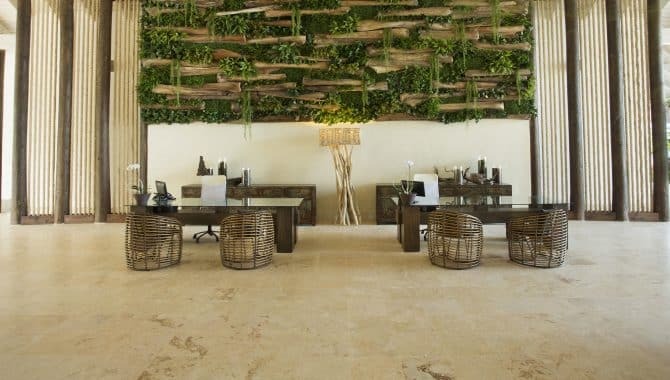 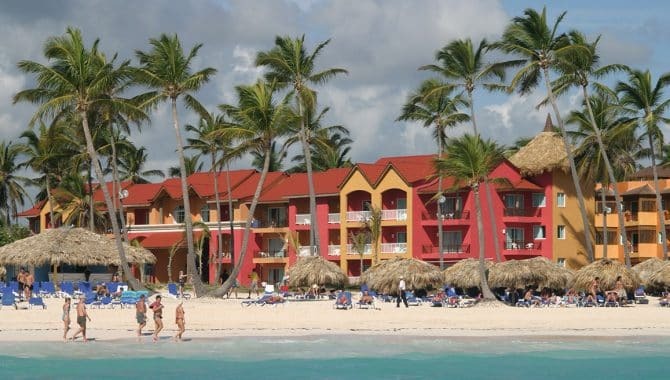 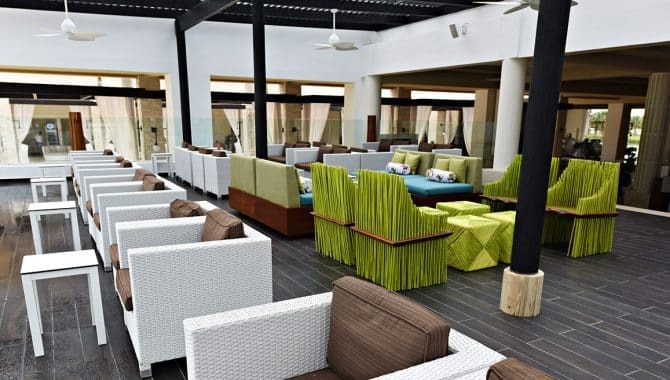 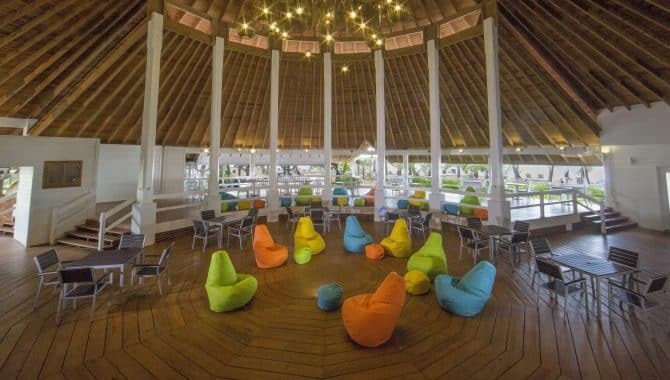 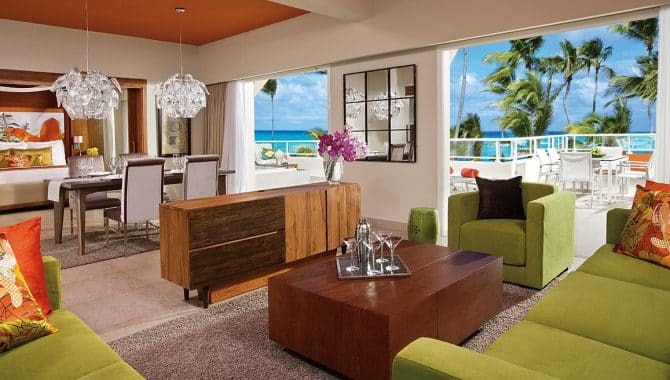 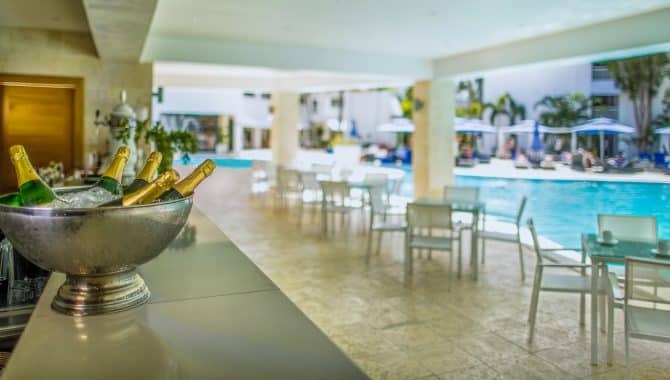 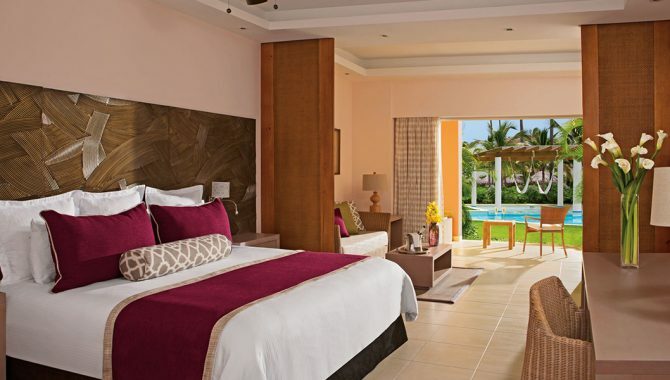 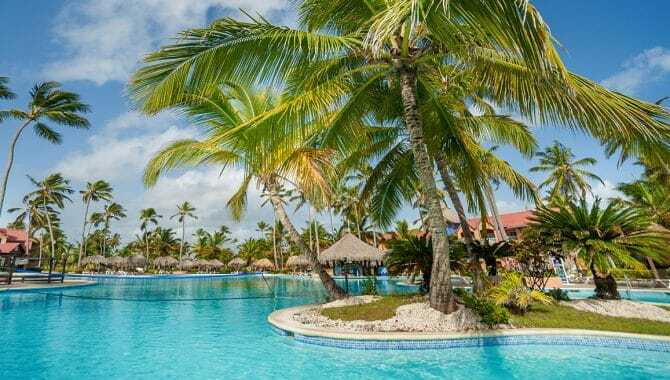 Enter the Punta Cana Princess, one of the premier resorts in Punta Cana and a great place to plan your Dominican Republic getaway and you’ll be greeted with a welcome drink—just one of the many personal touches that make this destination so popular. 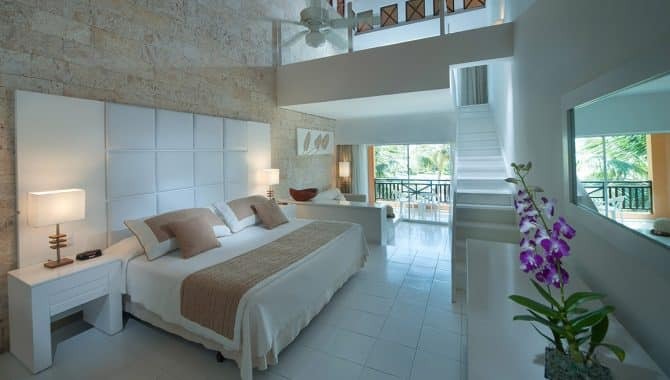 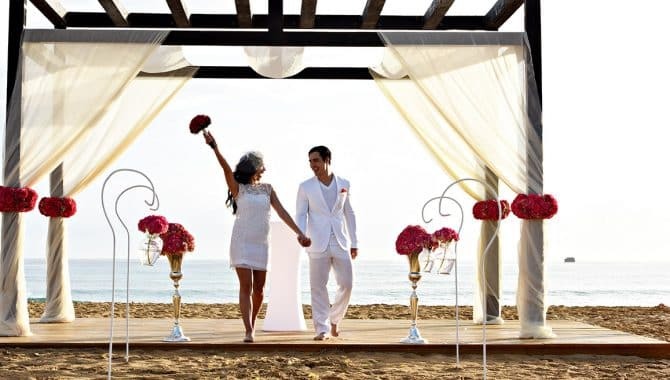 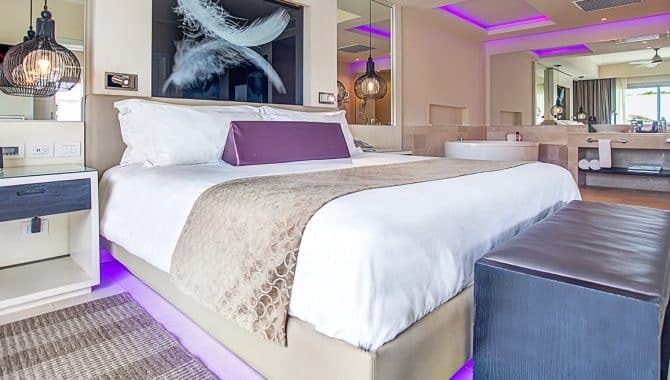 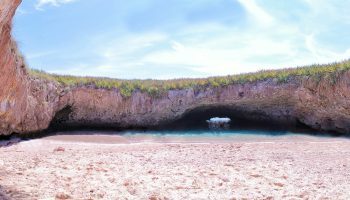 This ideal romantic retreat is an adults-only property with lots of all-inclusive amenities that will keep you and your fellow travelers more than happy for the duration of your stay, including access to a beautiful beach, on-site spa and gym facilities. 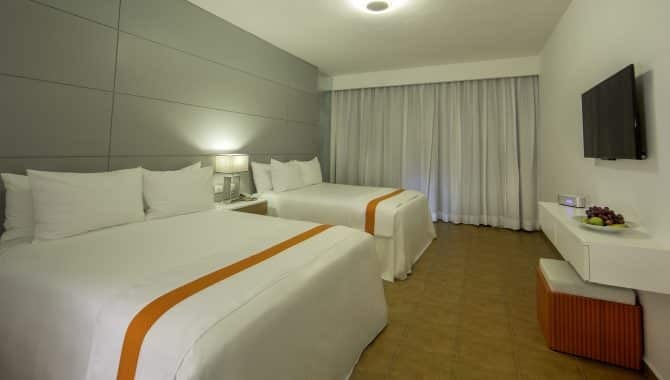 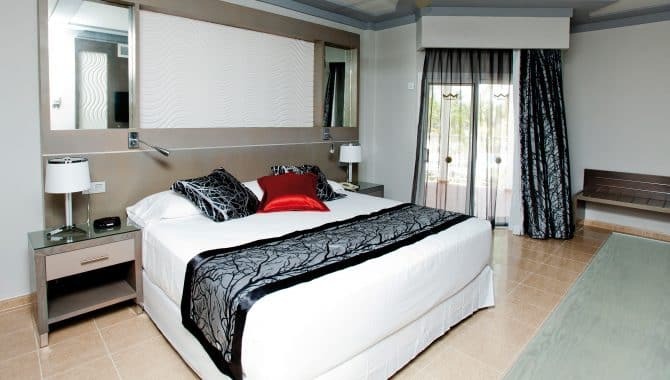 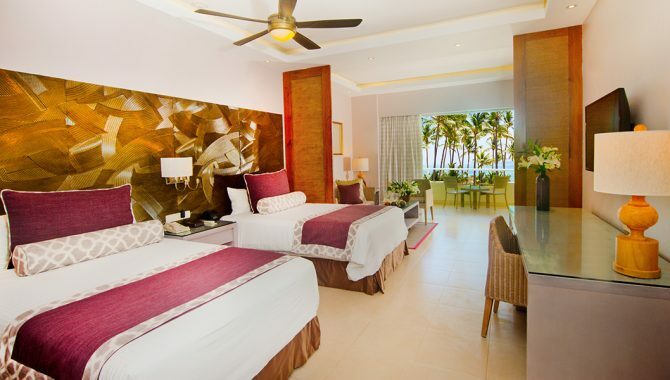 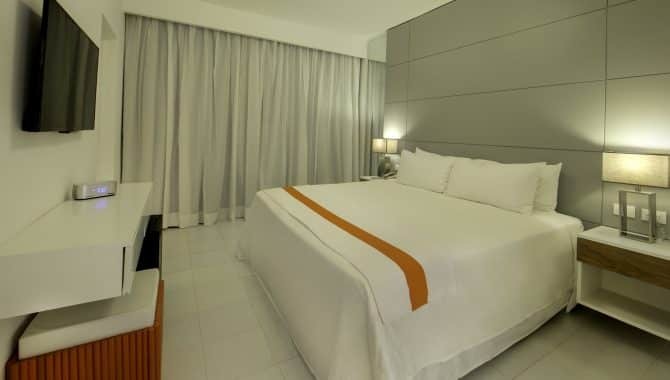 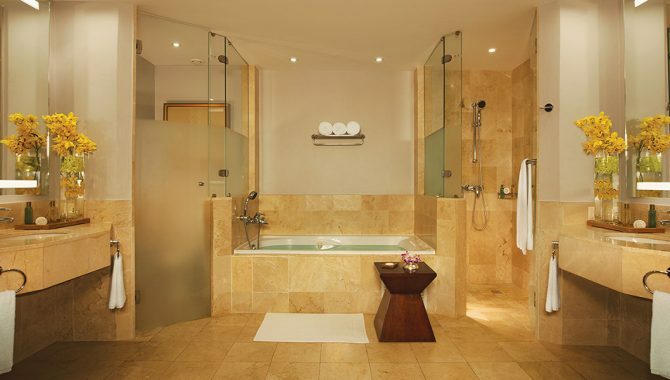 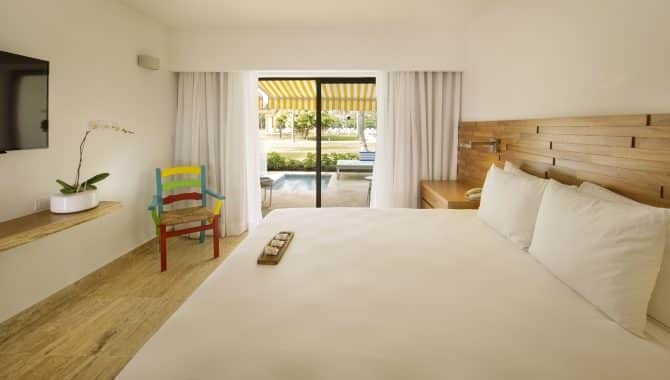 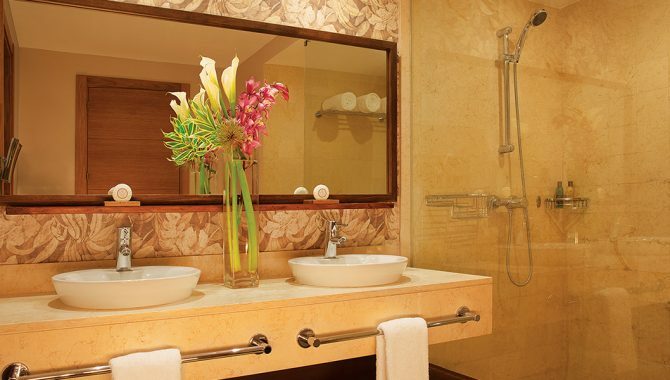 Additionally, all rooms are suite-style and come with deluxe features like Jacuzzis and private living room areas. 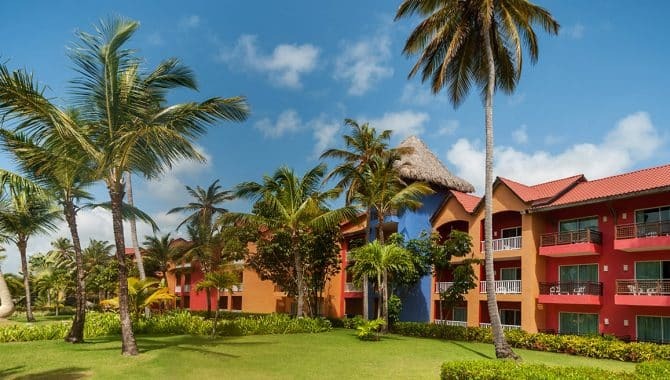 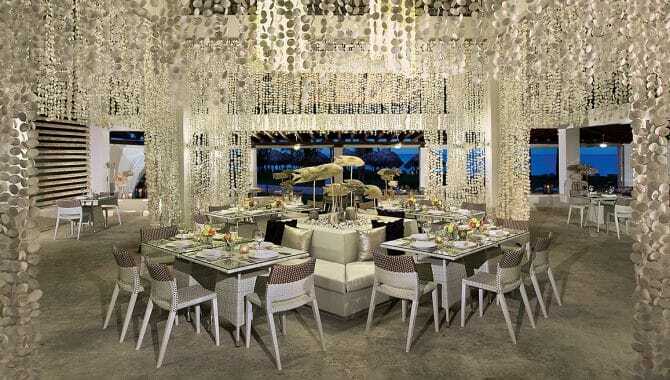 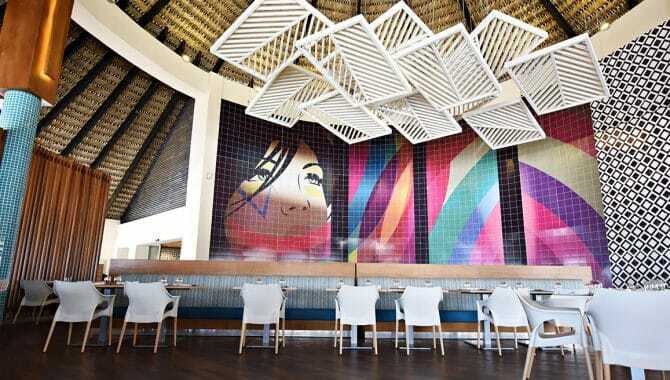 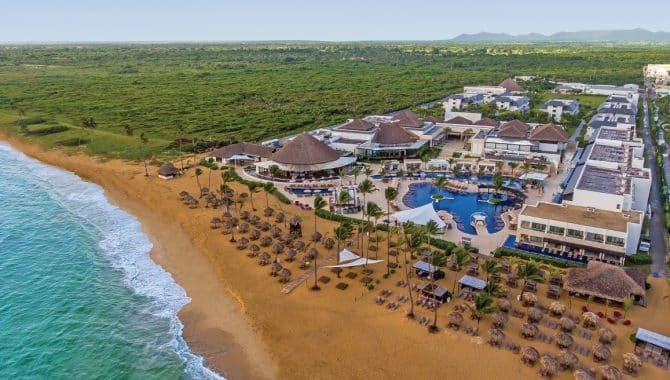 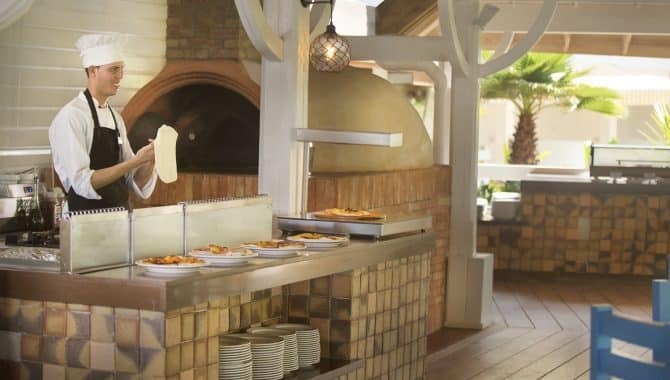 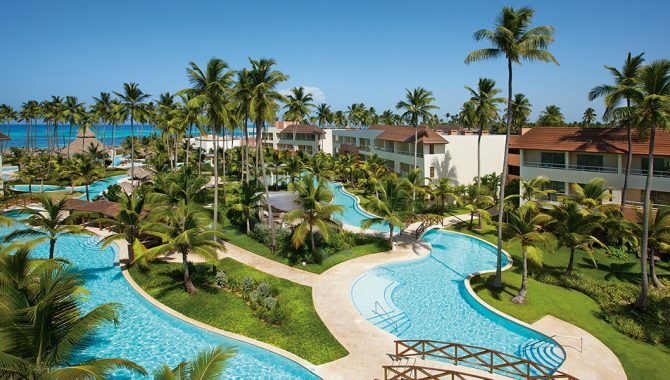 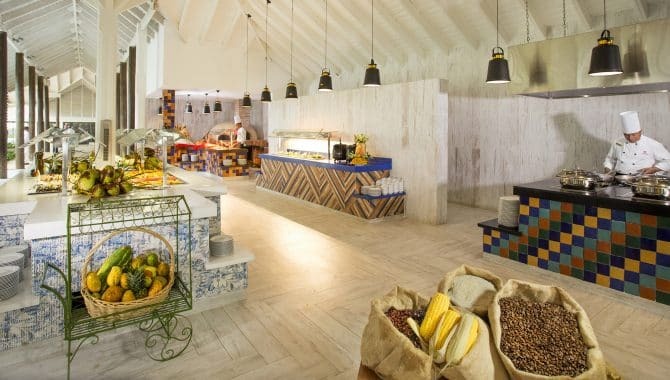 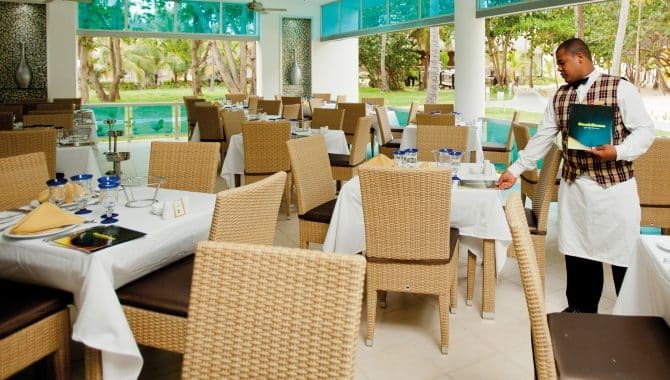 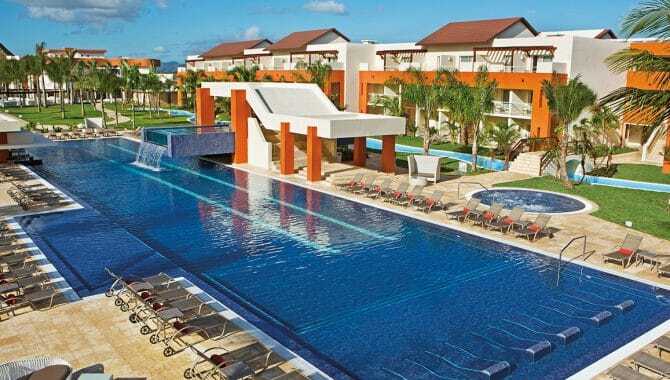 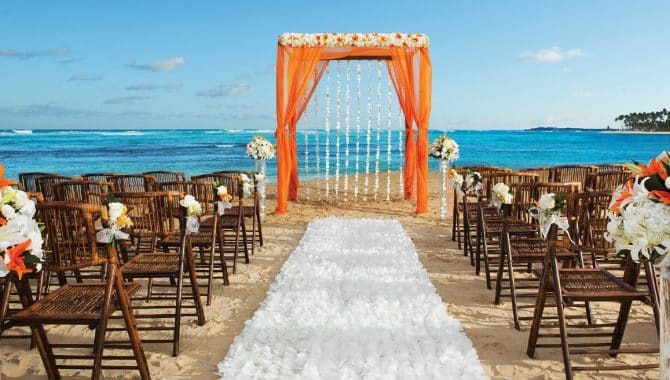 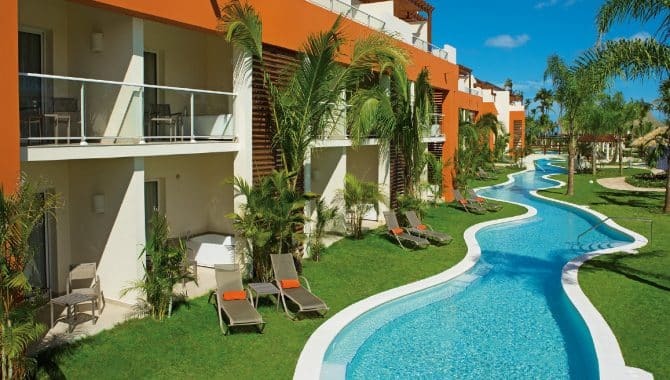 Like many resorts in the area, the Punta Cana Princess offers a varied array of dining options on-site, including a central, all-day buffet close to the lobby and a breakfast buffet option right on the beach. 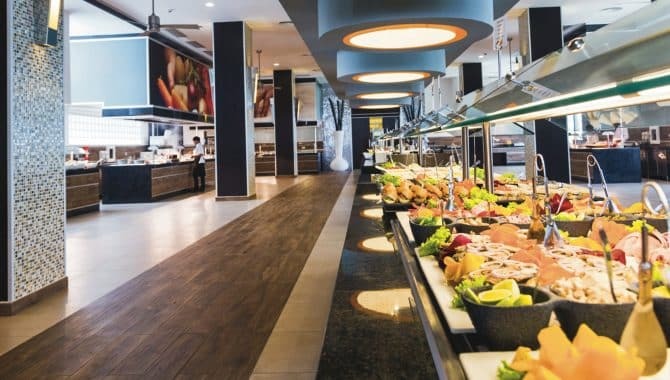 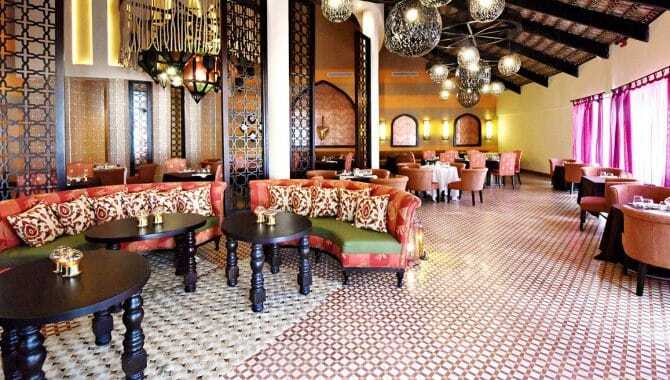 In the evening the beach buffet becomes Mare Nostrum, an a la carte Mediterranean restaurant, and that’s not the only option for dining around the world. 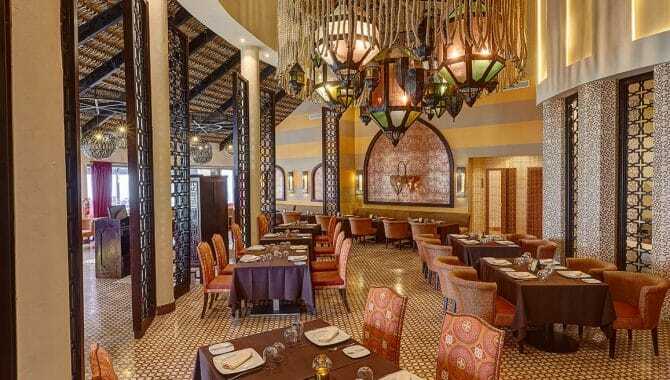 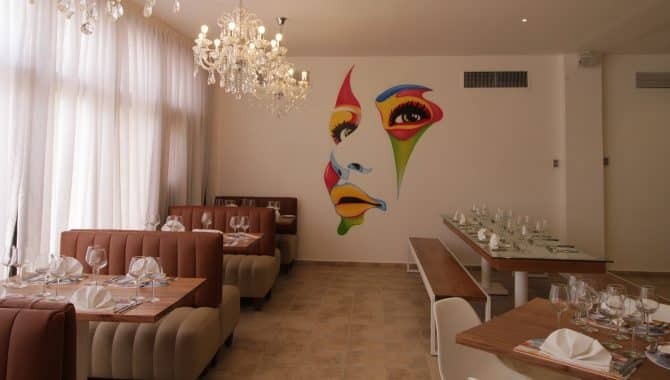 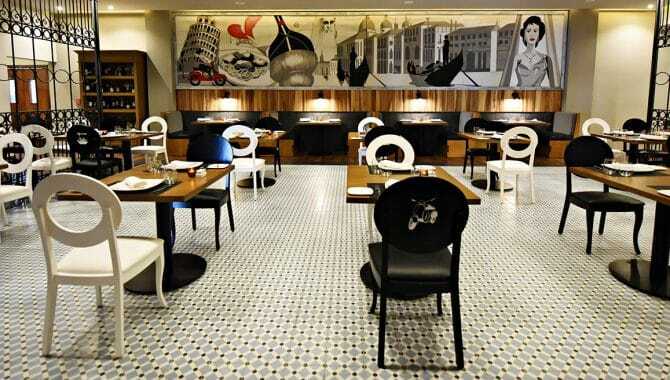 There’s also the Italian restaurant Il Bacio, Swiss food at Le Petite Fondue and hearty American fare at Rio Grande Steakhouse.